Ahhh, Fridays. What's not to love? Especially in the summertime. There is always such a surge of energy for us on Fridays with the weekend expectation looming ahead. Today, we are treating ourselves here to a little out-of-office lunchtime, and I can't wait. I think I might also spring for a Starbucks. You know, because it's Friday! I think that sums up my/our goals in life pretty well, don't you? The other thing that has been on my mind this week are shoes. Bloggers all over were a-chatter with Louboutin Love this week for some random reason, and I am fully on board, having already bookmarked a few things Monday that caught my eye. Thanks to Sugar Network for this first beauty. I am totally loving the sparkly edginess. And then at the end of last month, a guest blogger over on Nola Girl (don't even ask how I have stumbled onto this blog, it's super cute, and so I don't even care that I have never been to New Orleans!) 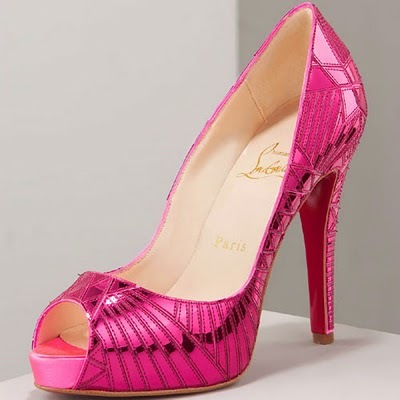 posted shots of her fav Louboutins, which, coincidentally, are some of my favorites too! Drink up the fabulousness, ladies (and gents haha! I heart you, too!) and have a wonderful TGIF! PS. Can I have these hot pink ones, like, now?? LUST. I'm glad you found my blog!! Didn't Bumpkin do an amazing job with her guest post. 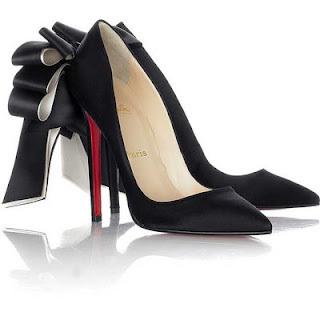 I was swooning over that second pair of LB's - those bows! !